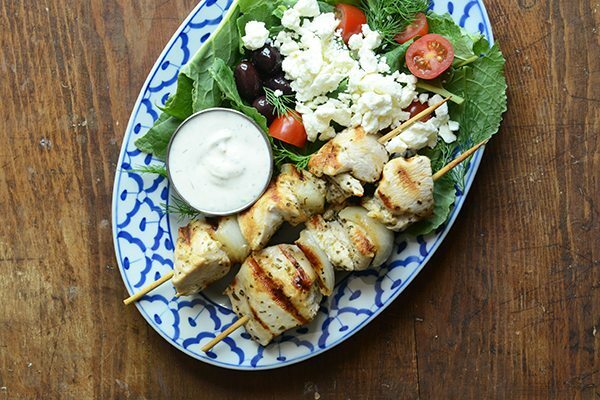 Try these Greek Chicken Kebabs for a fun meal that’s full of Mediterranean flavor! There are some meals I typically only eat at restaurants. It’s not because they’re hard to make or require a lot of crazy ingredients; to be honest, I have no idea the reason why! In any case, Greek chicken is definitely something I usually only order out (I think I’ve made it at home maybe twice in the past three years), but that needs to change. This homemade version is easy to make and always a crowd-pleaser. You probably have all the ingredients for this already on hand, and this recipe is a great example of how a few simple things can come together to create something that is way more delicious than expected. Both times I’ve made it, my hubby has gone crazy for it and told me I need to make it more often. Note to self: incorporate this into our regular meal rotation! This recipe makes two servings, but it’s easy to double without adding too much extra effort or even quadruple if you’re cooking for a crowd. It’s the perfect little gem of a recipe to have up your sleeve for summer months when you’re looking for new meal ideas for the grill (but an indoor grill pan will work well for this too!). 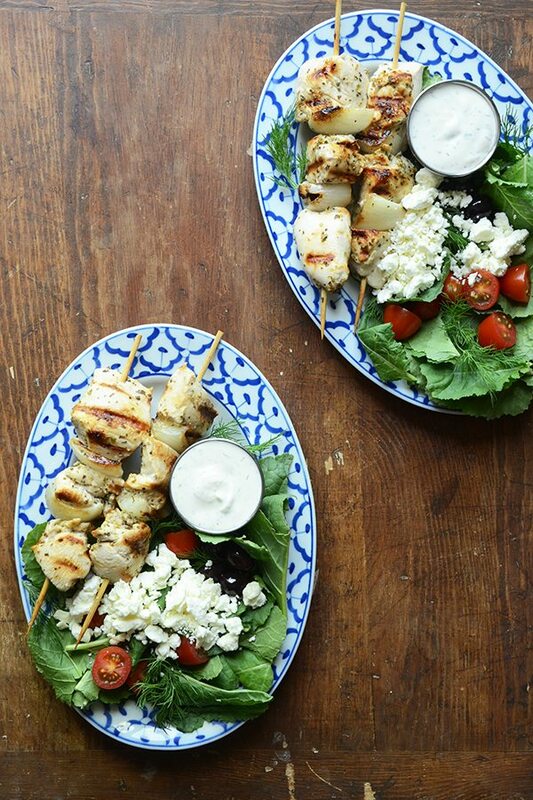 We like to serve this chicken as a big salad, but it’s also delicious wrapped up in pita bread or along with rice and a side salad. Whisk together the lemon juice, olive oil, oregano, salt, and pepper in a large zip-top plastic bag. Add the garlic, onion, and chicken, zip the bag closed, and squish everything around so the chicken is coated. Put the plastic bag inside a bowl and refrigerate 30 minutes, or up to 2 hours. 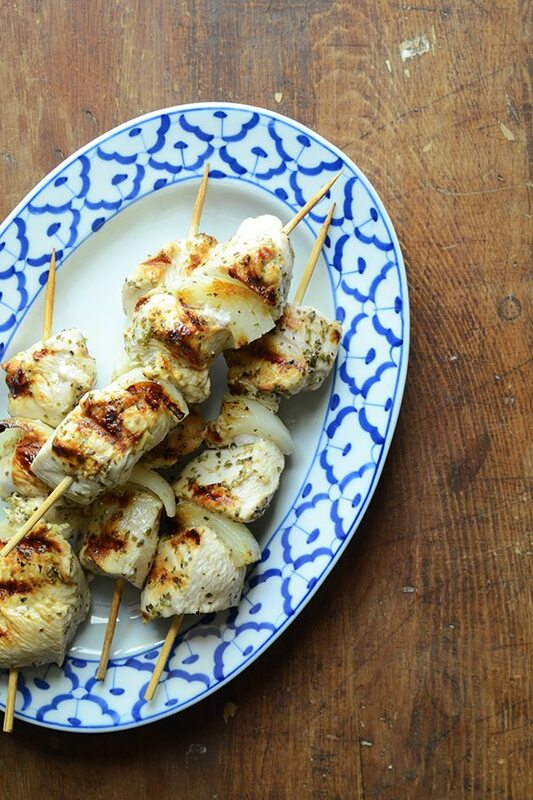 Thread the chicken and onion onto skewers and grill (on an outdoor grill or an indoor grill pan) until fully cooked, about 8 minutes, flipping once halfway through. 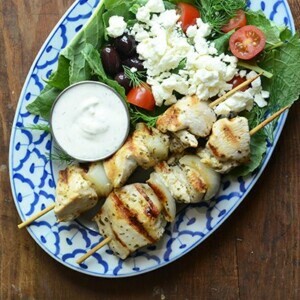 To make a Greek chicken kebab platter, serve the chicken on a bed of lettuce along with fresh herbs, tomato, olives, feta cheese, tzatziki sauce, and/or pita bread.